Update – August 12: We have a quick update to share today for Florida residents interested in our annual pass monthly payment program option. You can now purchase and renew Florida resident annual passes at any Walt Disney World ticket window. If you recall, the option was initially only available for those of you who purchased an annual pass online. Check below for more details about the program. 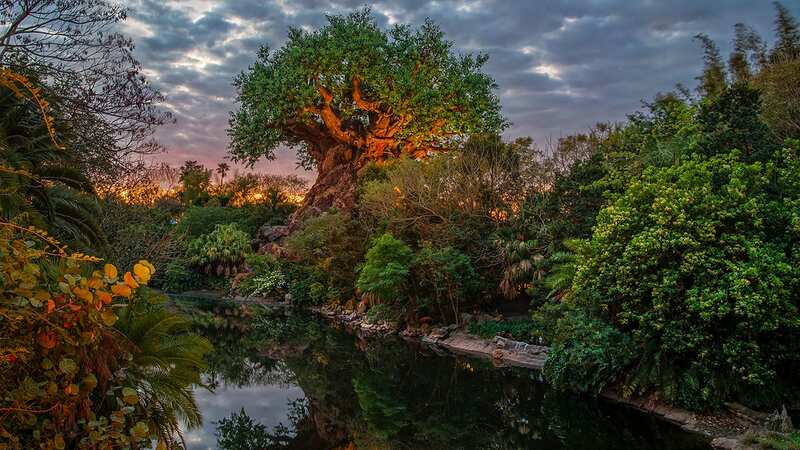 Attention Florida residents … we’ve got some great news to share for those of you looking to spread out the cost of buying Walt Disney World annual passes. Our annual pass monthly payment program is now available online. And how it works is simple. Florida Residents make a down payment equal to the price of a non-discounted one-day Magic Your Way base ticket and then pay the remainder through 12 recurring automatic monthly payments scheduled for the year. It’s interest and finance charge free. What are the benefits of being a Passholder? The list is long but most importantly, you have access to Disney “magic” all year — attractions, characters and events (the Epcot International Food and Wine Festival is right around the corner). You can also customize your Disney experience when you select the Walt Disney World Florida Resident Annual Pass that’s right for you. Find your Pass at http://www.disneyworld.com/payments. Oh, and please let us know if you’ll be using this payment option in the comments. Bummer, was hoping this would be available for ALL guests. We’ll be down in Orlando for 2 wks in Aug but sadly will be skipping Disney this time…A family of 8 with several teenagers the cost to purchase 8 AP’s at once is just too much. I have been an AP member for several yrs but have held off on getting one for everyone. We are in FL several times a yr. so an AP makes the most sense. Our theme park budget only goes so far. We were able to purchase the Universal Season pass under a similar program (they too have also switched back to just FL residents but are reconsidering). We have participated in a similar program with Busch Gardens for the past 6 yrs. Sorry Disney, it breaks my heart to know that I’ll be so close, but the kids all want to see the new Harry Potter, so mom’s been outvoted. I hope Disney considers adding this for everyone!!! I wish this was available to all annual passholders. I have had an annual pass to Disney World since 1988, when I started it was just me now we are a family of five and it would be much easier if we could spread out the payments!! What about dvc members, it would be nice if you could pay for your passes along with your monthly dues! So much easier to purchase annual passes for a family of 4! I’ve been holding out for this! Thank you. Thank you. Thank you! It’s about time, hopefully it won’t be long and it will be open to everyone. We had annuals for years then as the prices went up it was harder to make that huge renewal payment. When we had annuals we would go every other month, now we go once or twice a year and can’t get annuals because I refuse to chuck out $2200 at once. SeaWorld has been doing the monthly payment option for a long time. Crossing my fingers and hoping they’ll open it up soon I would love to go to DisneyWorld during Thanksgiving, Christmas and New Years. Can you take advantage of this if you’ve already got a 1 day ticket as a part of your vacation package? We do it that way to be able to get the dining plan. How would this work. We really want to do the annual pass and this is a great way to do it. We also want to keep the dining plan during our vacation. Make it applicable for renewals as well! We are the people who have been buying passes for years and years. I’ve had mine since 1993 and we should get this “perk” as well. I am moving to FL in the next month and this will be a awesome option to have available. I will be using this !!! We have purchased the florida resident premium annual passes for our family and almost wasn’t able to this last time because of the amount that we needed to pay all at one time. If this is going to be offered it really should include the renewal to keep us coming back year after year. Even if it isn’t spread out month to month, if the payments could be broken down somehow that would help, like 6 months same as cash. We love Disney and enjoy going very often, but let’s face it, times are rough for alot of us and this is not a necessity, so it would be great to have this option for renewals also. The reasoning behind only offering it to FL residents had to do with the fact that someone from outside the state would more likely abuse the system. You can imagine a family from up north buying into the payment plan going twice in one year. After the second trip they have no incentive to keep paying for the pass because they know they are not going to be back before it expires. The guests can cancel the card and Disney’s only recourse is to cancel their AP (no big deal not going to use it again) and maybe sue them which may cost more than the balance. I guess they could keep them from buying any more passes but I’m sure people will find ways to get around that. FL residents are more likely to visit more so they will keep paying. Also there maybe more legal means to recover the money. As for why not GA residents just over the border, well they have to draw a line somewhere. Disney could make this easy on DVC members: make DVC members qualify as Florida Residents. C’mon Disney! Let’s get it together! This really should be offered to anyone! OH THANK GOODNESS!!!! YOU HAVE MADE ME SO HAPPY! It’s so much easier to budget this! We just had a baby last year, and have had to make some budget cuts, which included the park passes. IF we can budget it over 12 months, it makes it that much more worth it! @Kristi’s comment. It’s unfortunate that Disney doesn’t allow NorCal residents to make the payment plan available to them since I’m sure you would probably make trips to go there more often. I live in Socal, and my family (there’s 5 of us ) and I pretty much go 4 or 5 times a month because we are able to make the payment plan. I assume their logic would be that people who live close by may be more inclined to go in a higher frequency (meaning you’ll spend more money more often) than just 3 or 4 times a year. That’s just my guess. Hopefully they’ll open it to more residents. Awesome! It is about time! Especially in this economy when it is very difficult to come up with that amount if you have a family. I would probably go at least 2 more times this year if this was available to DVC members. It is really disappointing that Disney is not offering this to non FL residents. People who live outside of FL who travel hundreds if not thousands of miles to get there are given nothing? Where is the logic here? You would think that since FL residents get discounted tickets and discounted hotel rooms Disney would have offered this to the people who pay the higher price. You may want to rethink that. #69 is not entirely true. Fl. residents do receive deals from WDW. They have resort offers etc. I have a friend that lives there and she takes advantage of them from time to time. So saying Fl residents NEVER get anything is false. Well, how about the Georgia residents who live on the Ga/Fl line?? We spend more money in Florida than in Georgia AND probably have been to WDW more than most Floridians (over 165 times, thank you very much). I’ve always loved and believed in this company (I own stock in Disney). If Universal Studios can do a monthly payment for EVERYONE, then why can’t Disney???? I spent almost 15 days in Disney last year alone,I’ve been a faithful customer, so why can’t I have some of these deals and opportunities?? I’d be down there more often, and you’d get more $$$$ out of me…..THINK ABOUT IT DISNEY!!!! One lady asked why limit it to fl. residents only..because Fl. residents never get anything discounted or a deal we pay the same as everyone else.Senior citizens casn not afford to pay these prices. This should be open to all Pass Holders! Guess Disney only interested in keeping their Florida Pass holders! Not fair that this is only applying to Florida residents? And then for only for new AP purchases and not renewals? I would venture to say most Disney visitors are from out-of-state and visit more often. I will have used my pass 4 times in a year by the time my AP expires and was able to do see Disney at Xmas, for the Flower & Garden Show, my family trip (next week) and then coming up the Food & Wine Festival. Without the AP I would not have been to afford all of the tickets. With that being said…what about current passholders getting ready to renew? What about DVC members new/renewals? This is what we have been waiting for! we can’t afford $1000 plus for APs for our whole family, but now we can! Merry Christmas to my kids (and me)!!!! Thanks! too bad i just laid out $767 last month for 2 passes. i’m kinda ticked right now. I love, love, love this!!!! For me and my sons to get annual passes it was QUITE an expense (as you might guess buying 3 at a time). Being able to spread the payments out will help a lot!!! Some of the caveats on the payment plan page have me concerned though. For instance, you can’t renew a pass at this time (question 9 on the page). That’s my biggest concern. My AP doesn’t expire until April 2011 so I’m hoping that will give Disney time to roll out version 2.0 of this program so that current passholders can renew online. Great idea!!! Long overdue!!!! Very, very exited about this!!! Well, I have been just waiting for this – finally! Squee! I really hate that they don’t open this to neighboring states. I live in Georgia and I am closer to Disney than most of southern Florida. Help us out!!! Too bad this is only offered to Florida residents. If my kids & I had annual passes we would go to Disneyworld more often. A payment plan for annual passes would help make is some much more affordable. Hey what about Georgia residents too!! I live only 3 hrs from Disney and go about six times a year. Come on Disney!! I don’t get it, the non-resident AP is about $100 more than the FL resident AP, but they give the residents an easier way to pay for it than the non-residents. I am a DVC member and have always loved Disney, but between this and the 1.5 million – 8 million dollar houses I feel that Disney is closing me out. NOT feelin’ the love here! Why can’t they offer it to everyone, why descriminate against non-residents???? We have sea world busch gardens premium passes which are paid for using their monthly payment plan. This has been wonderfully affordable and so we will be considering spending as much time at sea world, aquatica, BG Tampa this year. In the past it’s been all Disney. The payment plan makes it so easy for me to budget. These days that’s important. If the Disney passes payment plan was available to residents outside if Florida then I would definitely sign up. I have the Premiere pass as a trade-in for my WDW and DLR AP’s when it came out. I will consider this new payment plan since i’m based back in Florida again and might not goto DLR next year. As for the FL-resident limitation, back at DLR guest services told me it was limited to SoCal because it makes it easier to find people who stop paying due to things like cards expiring and credit limits. Otherwise someone could get the AP, pay the first payment and monthly fee, visit for two weeks, then cancel their credit card – that’d be bad. I do think offering it to DVC owners and tying it their DVC membership would be a nice compromise. We have been waiting for this option for about a year now, glad it’s finally here, we will be upgrading from our three passes to annual pass holders soon! Thanks! I just want to thank you all so much from the bottome of my heart! As a father with a faimly of 5 the price to purchase this was so expensive right off the back but know I can’t wait to renew our passses with this GREAT OPTION! Disney thanks for hearing the families in this economy. Bless You! Yes yes and yes wooo hoooo! It’s about time!!!!!!!! I’m sure this is only open to FL residents (at least now) to cut down on possible abuse. If open to everyone and this is going to be “the one trip ever to WDW”, you could buy the AP for the initial down payment and first month payment (which is cheaper than a several day ticket) use it for a week, then just cancel the card that the payments are linked to. True the same abuse could with just Fl residents, but since they’ll have your information on hand (since you have to show your ID) they could also stop you from buying a another pass until the first one is settled up. Plus from a marketing stand point, they are trying to pull in those FL residents who are more likely to come several times through out the year. We all know the parks big money maker isn’t admissions, the big money is in food and merchandise, so with more potential repeat visitors the more potential for revenue. I am upset that it is only for new AP’s and not renewal…so now I must make the decision to either drop a lump sum, but lesser overall sum of cash, or pay more but over a longer length of time. Will definetely be taking advantage of this! Been looking forward to having this option available, thanks! We will definitely be using this…we are a family of 4 and there is no way we could afford to pay all of it upfront. This is giving all families in Florida the oppurtunity to visit Disney. Thanks!!! Limiting this option is an issue. I am a 15+ year DVC member which while it does not make me a Florida resident, makes me someone committed to the propoerty in Florida. I enjoy my DVC discount but would also love to spread it out. AS it is I have an AP and I buy 10 day no exp passes for the rest of m family every other year..that particular year it is quite a hit. I can’t believe it!! We will absolutely be using this!! I’m excited to see the new weekday annual pass is offered. We usually go during the week while staying at DVC (fewer points during the weekdays). LOVE IT!! Can’t wait!!!! Our current passes expire in November. We will for sure be taking advantage of this for our renewal!!!!! Imagine how much Disney would make if the monthly payment plan were available to everyone. It would bring in more visitors in to both parks (‘Land and ‘World.) I’m certian that there are a lot more of us out there with four plus members in our familys who could use the break of monthly payments.This would also free up money quicker for more Disney vacations, thus spending even more money at the parks. I’m shocked Disney hadn’t realized the revinue lost by keeping this option local. 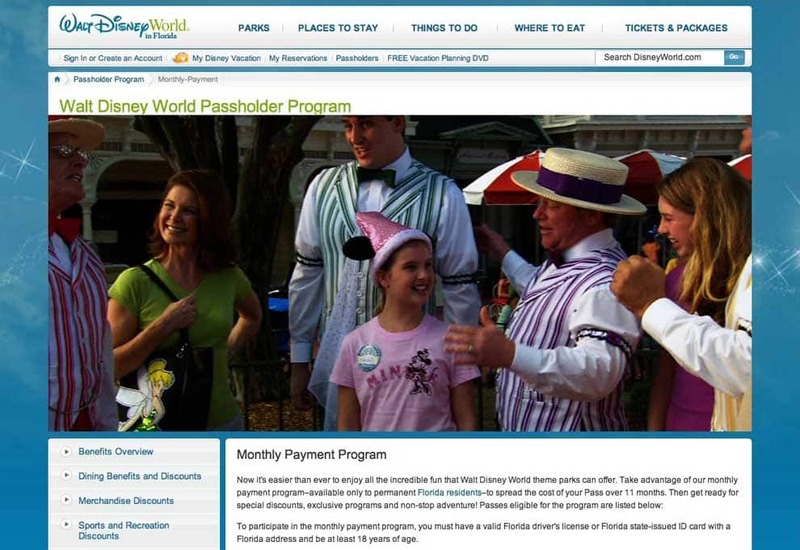 I would love to buy an annual pass even though I only visit WDW once a year, I might be able to take advantage of air fare deals and visit more, not to mention qualify for discounts afforded annual passholders. Come on Disney let everyone buy annual passports on payments! Will there be any extra benefit for paying your pass in full? My only question is when does the year start ticking away. We are going in November and have been saving up money to buy the FL Resident Weekday Pass but do not want to have it activated until we actually go in November. Does this payment option still allow you to receive a voucher that you don’t turn in until you arrive at Disney, or does it activate as soon as you place your down payment? Thanks for the help. My inlaws are DVC members so we are down there quite frequently from our hometown in Ohio. I really think this is an option that should be extended to people outside of FL. There are so many people that would buy annual passes instead of park hoppers with the no expiration dates if this was made available to all. I don’t understand why they can’t break the initial investment down a little more. I was really hoping this would be run in the same way the busch gardens EZpay system does. My initial investment for that pass was $6.25 per person, that’s much easier to swing than >$70, especially for the larger families in this economy. Unfortunatly those parks will continue to get my buisness until the initial investment for disney decreases.